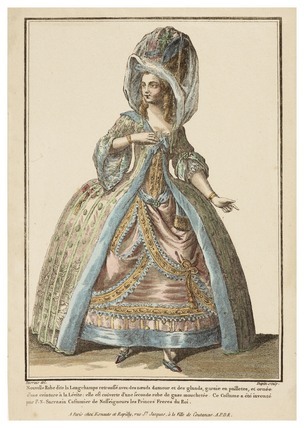 Coloured print of a woman standing, from Gallerie des Modes. In 1778 Jacques Esnauts and Michel Rapilly of Paris began to issue their La Gallerie des Modes publication of coloured fashion plates. Published over a 10 year period, the plates were elegantly drawn, accurately engraved and hand coloured by the most celebrated fashion artists of the late eighteenth century.